An infographic from the industry experts at Builders Mutual. In the construction industry, many new employees are relatively undertrained. Therefore, it is extremely important to provide safety education to all employees on their first day of work, before they step onto your job-site. As industry experts at Builders Mutual, we are dedicated to setting you and your employees up for success. That’s why we are providing this quick reference tool that you can use when training new employees. According to OSHA, falls are the leading cause of death in the construction industry, and in 2016, one-third of these falls were falls from ladders. More than 150 construction workers died as a result of ladder misuse. Ladder accidents also caused more than 20,000 workplace injuries in 2016, according to the Bureau of Labor. Fortunately, falls can be prevented through proper training. 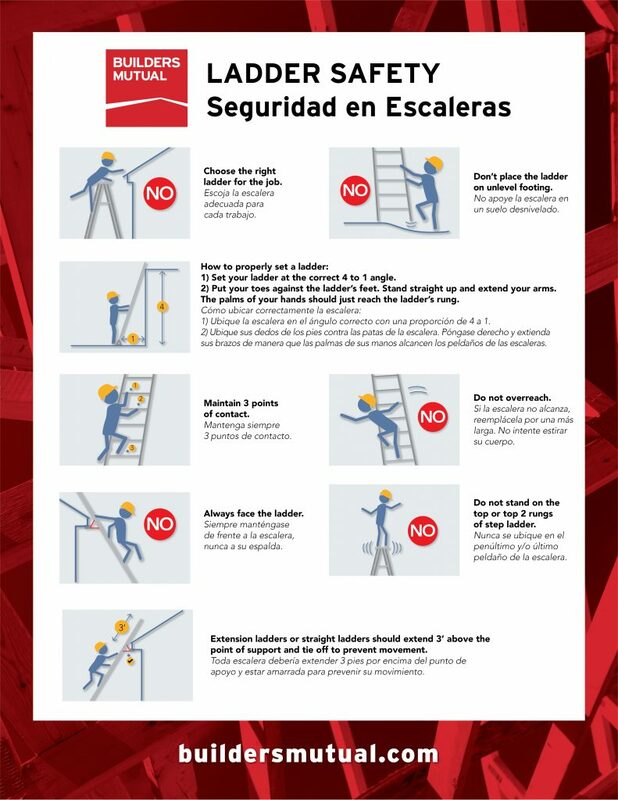 The ladder safety infographic below, presented in English and in Spanish, explains important steps to remember that will help ensure on-the-job safety for your employees. Click here to download a full PDF version of the infographic to provide to your team.